Pearl fashion earrings with approximately 0.40ctw diamond melee and two 10mm pearls. Pearl drop fashion earrings with approximately 0.32ctw diamond melee and two 10mm pearls. For a timeless gift of exquisite elegance, it is hard to top the combination of pearls and diamonds. Pearl earrings, accented by settings that highlight sparkling diamonds, create a look that demands attention. Any woman would be thrilled to have this combination of precious gems hanging from her ears. Many people may not be familiar with golden pearls, but these beauties can really make a pair of pearl earrings come to life. Golden pearls achieve their color naturally within gold-lipped oysters. South sea golden pearls offer an interesting and very pretty alternative to classic white pearls for those looking for something a little bit different in their pearl earrings. These beauties in a Brian Gavin Signature Select pearl earring setting of 14 karat yellow gold make for a shimmering treasure trove of gold. Settings of brilliant 14k white gold complement white pearls in a very aesthetically pleasing manner. 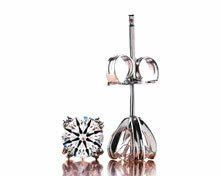 Each of the settings offer breathtaking diamond designs against the white gold. These earrings are visually reminiscent of the jewelry worn by royalty for centuries. Queen Elizabeth I, for example, was known to have quite an affection for pearls, wearing a rope strand around her neck and regularly having the gems embroidered into her clothing. Pearl earrings make an incredible gift for pretty much any occasion. Combining pearls and diamonds in these magnificent pearl earring settings is a guaranteed recipe for a gift that she will remember and cherish forever. All of the Brian Gavin Signature Select settings are handpicked by Brian from vendors who have proven themselves to adhere to the stringent guidelines of quality and design set by Brian. These settings are displayed alongside of Brian's own brilliant creations, so Brian is very selective about the types of jewelry that make the cut. 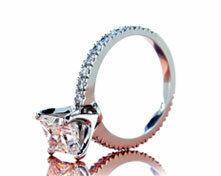 As with any jewelry purchase, it is critically important to know and trust your jeweler. The expertise and many years of experience of the team at Brian Gavin Diamonds is enough on its own to make you feel very comfortable with your shopping. Add to their knowledge the fact that they are genuinely proud and happy to help you find the perfect piece of jewelry for any event or occasion and you know that you are in safe, reliable and friendly hands when looking for a gift that will have the emotional impact you desire. Brian Gavin and the entire team at Brian Gavin Diamonds are very enthusiastic to get to know you as not only a customer, but as a friend. Their relentless devotion to the satisfaction of their customers makes them the ideal folks to consult when looking to buy a beautiful pair of pearl earrings or any other piece of fine jewelry.